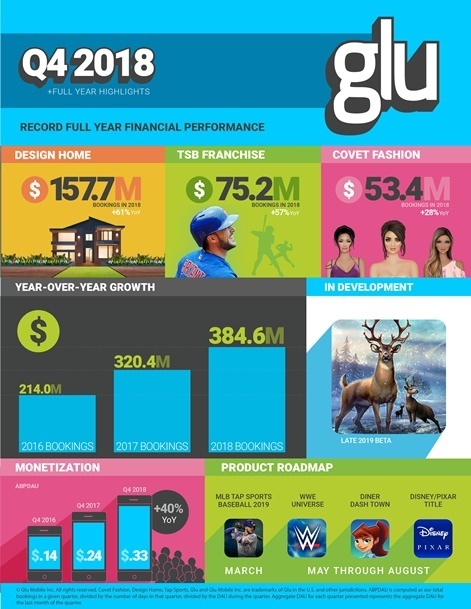 Glu Mobile increases revenue 28 per cent in 2018 to $366.6 million as the company closed in on being profitable again. Full year bookings reached a record $384.6 million up 20 per cent year-over-year. For some perspective, in 2016 bookings came in at $214 million. Fourth quarter sales for the three months ending December 31st 2018 rose 19 per cent year-on-year to $95.6 million. Bookings for the period grew 18 per cent to $98.2 million. Losses for the quarter were reported as $1.3 million, significantly better than the $39.6 million loss the company made back in Q4 2017. Glu Mobile’s earnings were powered by its flagship title Design Home, which made $157.7 million in bookings 2018, up 61 per cent year-over-year. The publishers Tap Sports Baseball franchise meanwhile brought in $75.2 million (up 57 per cent), while Cover Fashion generated $53.4 million (up 28 per cent). The Crowdstar acquisition is paying off handsomely for Glu. Average revenue per daily active user was also up significantly in Q4 2018, rising 40 per cent year-on-year to $0.33. Interestingly, all this comes despite declining DAUs of 3.2 million and MAUs of 21.1 million. The latter rose quarter-on-quarter, but is down year-on-year from 28.6 million. Looking to the year ahead, Glu plans to release MLB Tap Sports Baseball 2019 in March, with WWE Universe, Diner Dash Town and a Disney/Pixar title expected between May to August. A new mobile Deer Hunter game is also in the works for a 2020 release date, as well as two additional original IP titles. “Our strong fourth quarter performance capped off a great year for Glu and our shareholders. Bookings for the full year grew 20 per cent on the strength of our core business driven by the successful execution of our growth games strategy,” said Glu CEO Nick Earl. “The top line growth we delivered drove increased profitability on an adjusted EBITDA basis each quarter throughout 2018 on a year over year basis, reflecting the scale in our operating model. 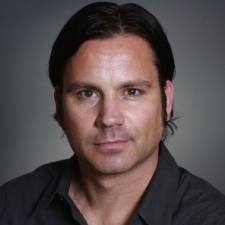 “We enter 2019 with a profitable and expanding core business and a strong pipeline of original IP games that we plan to launch this year and beyond. “We are excited to announce that one of the games in development is the next generation of our highly successful Deer Hunter franchise. This new game will combine a proven game mechanic with a deeper meta layer that we expect our fans will love.